WhatsApp now is more spicy for its users. The recent update has allowed the users to play with text formatting. You can make texts bold, italics and use strikethroughs. 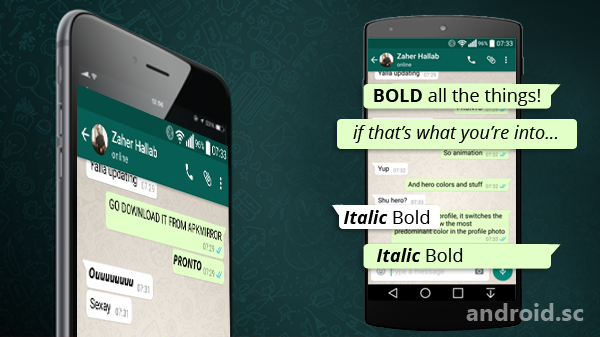 With these features, WhatsApp has added a few features of word processor. With this it intends to come closer with other chat apps like Slack. Also, it’s also much easier to use these options. You just need to remember a few keyboard shortcuts. Use underscore (_) before and after the word(s). WhatsApp is increasingly upgrading its features to stay relevant. Not long ago, It added a feature that made it possible to share documents with cloud service, similar to Google Drive or Microsoft OneDrive. Now the user can attach a PDF from other sources like cloud services. It also added a feature of ability to share images and pinch to zoom in on videos.